Outcomes of Upfront Docetaxel with Hormone Therapy in elderly patients with metastatic hormone-naïve prostate cancer. Following CHAARTED & STAMPEDE, upfront Docetaxel chemotherapy became standard of care for metastatic hormone-naïve prostate cancer (mHNPC). We sought to evaluate our experience in the elderly group of patients (>70 yrs). A retrospective analysis was undertaken of 55 patients commenced on upfront docetaxel chemotherapy, from Jan 16 - Sep 17. Patients were stratified as low (LR) and high risk (HR), as per the LATITUDE study. Progression was defined as per PCWG-3 criteria. The progression free survival (PFS) was calculated as time from start of treatment to date of progression and the overall survival (OS) from the date of diagnosis to date of death or last follow up; analysed by Kaplan-Meier estimates and log-rank test. Rates of febrile neutropenia (FN) and affect of post docetaxel PSA were also evaluated. The median age was 71 (range: 53-83) yrs, with 80% (44/55) HR patients. Granulocyte colony stimulating factor (G-CSF) was used in 30/55 (54.5%) patients; these did not experience FN. The overall rate of FN was 20% where G-CSF was not used. 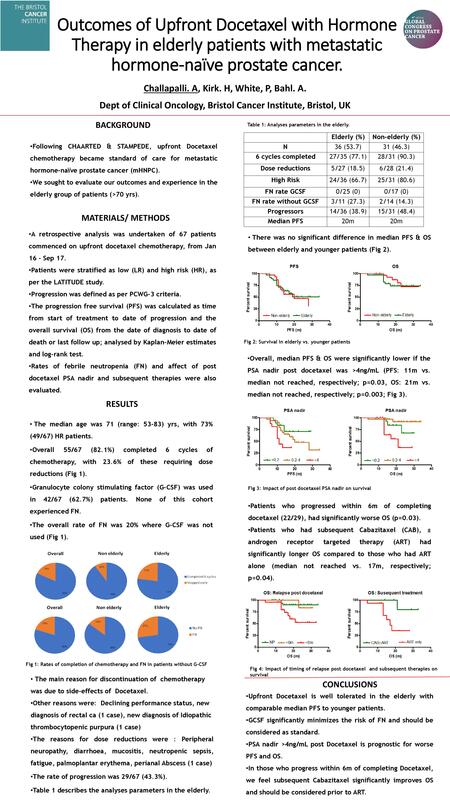 Overall 45/55 (81.8%) completed 6 cycles of chemotherapy, with 24.4% requiring dose reductions. Table 1 describes the analyses parameters in the elderly. There was no significant difference in median PFS between elderly and younger patients. Across all patients, median PFS & OS were significantly lower if the PSA was >4ng/mL at completion of chemotherapy (PFS: 11m vs. median not reached, respectively; p=0.03, OS: 21m vs. median not reached, respectively; p=0.0007). There was a non-significant trend towards worse OS for patients who progressed within 6m of completing docetaxel. Upfront docetaxel is reasonably well tolerated in the elderly with comparable median PFS to younger patients. Use of GCSF significantly minimizes the risk of FN in this group and should be considered as standard of care. PSA>4ng/mL at completion of docetaxel is prognostic for worse PFS and OS.